Did you hear about that Kiwi surfer who got flipped 3 metres into the air and knocked unconscious at Bondi by a whale's tail? Pretty amazing, huh, the whole thing; but I was most taken by how he said he saw the whale beneath him and talked to it like a dog. He had seen whales before, but even so - what, no trepidation at all? 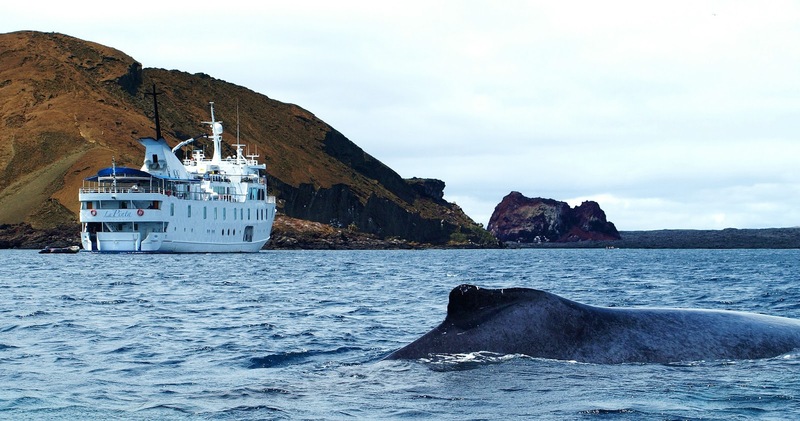 I've been closer to a whale than felt safe: in the Galapagos islands, when I was woken by the captain's PA that there were whales off the stern of the boat. I was so excited that I hurtled out of bed, flung on shorts and a top (that's all, to the comically sudden silence of the men in the group I was talking to about it afterwards), grabbed my camera and ran to where the inflatable was ready to take us out onto the water. We got up really close to the whale and her calf, who were just cruising round the bay, apparently quite unconcerned by our presence, and I took the above photo with my standard lens - no need for the zoom. The nature guide in the boat showed us how to look for the whale's "footprint" - a calm, slick area directly above where it's pumping its tail up and down. 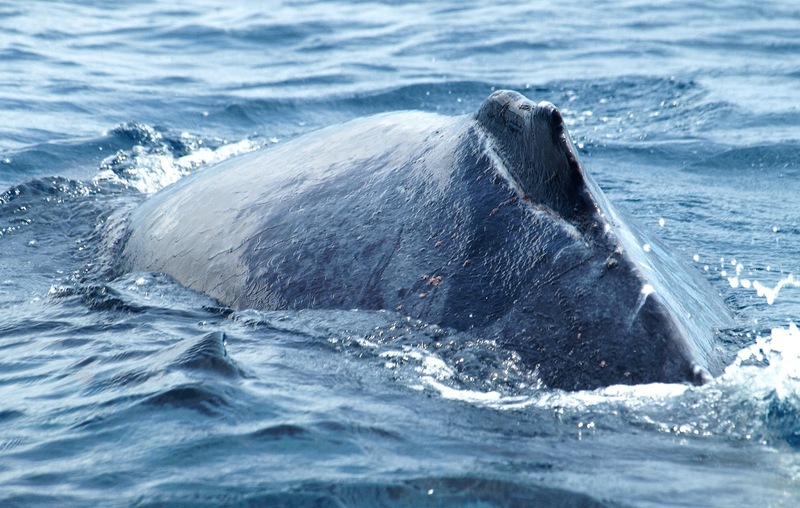 He took us straight over one, and the water was so still, and clear, that we could see right down to the whale's white belly as she swam on her side. Looked pretty close, to me; though that may be just because she was SO BIG. Either way, it wouldn't have taken much to flip our boat over - though, as it wasn't, I have to concede that the guide knew what he was doing. Just as well. I would have regretted that t-shirt thing, if nothing else.